For those who have heard of Coin Sailor they are probably wondering, "what is going on with Coin Sailor?" The condensed version: It's a matching tool - Think Bitcoin for Dummies meets EHarmony! Learn while answering questions to get suggested coin matches. This is part of the broader idea I got funding for in Chicago and had a team build the MVP there. Chainy planning his moves on the Sandy Beaches of Puerto Rico. Currently Crypto Learning Corner is an LLC. I've heard it's really rare for LLC's to be established with Crypto/Blockchain intents. I sort of see why now as it's hard to get funding. Venture Capitalists and others want to invest in C-Corps for legit reasons. Deciding on the method of execution to get there and if I even want to have it as a C-Corp in my former area of residence. I'd rather just dissolve it in WI, then have this company emerge as a C-Corp in Puerto Rico. Second, people really want to see a technical founder in charge of a project. In that respect I have to have a certain level of technical ability (programming) to carry the project further. About a co-founder, I personally don't feel it's the right time to add on a co-founder, but it's not out of the question when it's the right time. Coin Sailor also had issues when we wanted to monetize it. We would have been breaking the securities laws. This matching site part of Coin Sailor is more novelty but was definitely an MVP. Thankfully, it will stay free. As I'm self-teaching to become the technical founder I can clearly roadmap how to start building the original vision for Coin Sailor. A gamified education portal as I have done research on how to approach a better curriculum to teach non-technical people about Bitcoin and Cryptocurrency. I was damn lucky to have my idea presented at the right time when I first pitched it in Chicago. The market is down and when I got funding all the spirits were high. The CME (Chicago Mercantile Exchange) was doing Bitcoin Futures, it was in the news a lot. It reached $20,000. Yeah, it was GREAT timing for an idea that caters to helping new people learn about Bitcoin and crypto. That said, I think it's actually good for the market to be down in a way. Since I wasn't a programmer, but wanted to be first I can actually just focus on gaining these skills. The ultimate goal for myself is a full stack blockchain developer. Things worked out backwards, but I'm glad they did. Everything has to happen for a reason. I'm not really on the meet-ups and event circuit as much as I used to be due to studying programming. There are tons of hackathons going on and many education talks. There's reports that the community has unofficially grown by 200% since the New York Times article on Brock Pierce came out. Regarding the hackathons and some research I've been doing I have hope for Puerto Rico and also fear for Puerto Rico. At a hackathon I got a coding bootcamp as one of the prizes. This gave me the ability to meet local Puerto Ricans interested in a technology career. 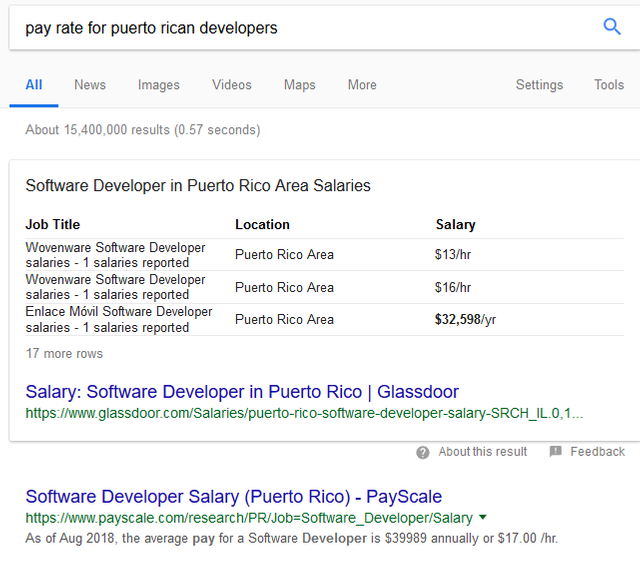 Here's the average pay rate for a Puerto Rican developer. Not sure how accurate this is, but it's really not a sustainable hourly pay rate. It's an okay pay rate, but that's another discussion diving into the logistics of that. In this coding bootcamp I heard about some of the teachers talking about how one of his friends was making $10 hour at his previous job. This individual was desperate to get a technology job so he took a $10 hour front end developer job. Why would Puerto Ricans stay here and work on the island when they could work food service $15/hr on the mainland or actually get paid better on the mainland? (Cost of living in relation to that pay rate is another discussion). These technology payrates are extremely upsetting to see/hear. This upset me because people put time into paying for their education and skills. It's because if you pay the employees at their rate here the business saves money on the employee salaries. I don't see many new technology businesses here raising skilled Puerto Ricans pay rates. As far as I know. I am highly concerned about the pay rates if Puerto Ricans are to do business with new technology companies here. I see technology jobs as a way for Puerto Ricans to get ahead, but not if they are being kept at the current rate. In what other field can you do a 3 month intensive bootcamp 40 hours a week for 12 weeks and come out with a $95k year skill if you finish a full stack developer course! (U.S Mainland rates) I would advocate for Puerto Ricans to freelance and learn how they hold the power of their own pay unless the employer pays accordingly. Using the free market Puerto Ricans could control their value. In Puerto Rico there is the Jones Act makes everything in Puerto Rico more expensive. The ships and crew have to be U.S owned for any imports to be delivered to the island. "As a result, it makes just about everything in Puerto Rico more expensive. A 2012 study from the New York Federal Reserve found that shipping a container from the US East Coast to Puerto Rico cost $3,063. But shipping the same container on a foreign ship to the Dominican Republic nearby cost only $1,504." Puerto Rico is closer to the Dominican Republic and South America. What I'm getting at is. I'm sure many in the Blockchain and crypto field are aware of how the Tariff war between the U.S and China is going to affect the island of Puerto Rico. It's really just a matter of when will we see it. If a Puerto Rican is to combat the prices of living that are Jones Act + U.S / China Tariff War what is the = going to be? 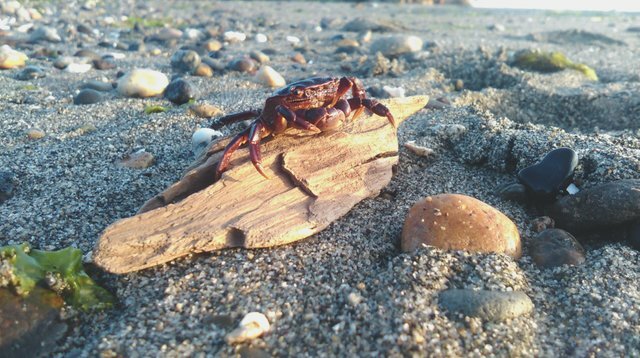 = leaving to mainland to find opportunities as they have been? I hope that part of the solution is literally intense coding bootcamps for Puerto Ricans with deferred tutition structures. They pay out of their first 9 paychecks and their skills making them at least $95,000 year incomes out of the gate. That's 4 months and a 3x increase in a Puerto Rican's income. They could move to the mainland and work for that rate and come back to the island and start businesses. There's many routes that this scenario could go. It's still an early concept as there are very few coding bootcamps in the Caribbean. This wasn't really an update on Puerto Rico, but more I suppose a related concern. Blockchain really is a gateway to many other technologies and the overall technology education on the island is directly correlated.